Bloor Street Underpass, originally uploaded by the workroom. Things like this make me smile on a daily basis. A huge and detailed mural was recently painted on the south side of the underpass just west of Lansdowne on Bloor Street West. It’s really quite pretty, mixing wallpaper imagery with trees, leaves and pine cones. I’m assuming that this is a sanctioned art piece, as it was put up gradually over a couple weeks, during the day. I walk along the underpass everyday and I think this is a brilliant way to improve a some-what unpleasant piece of the urban landscape. Also – Ellie told me about this a while ago, I really want to try it. I think this would be a good project for the workroom’s garden. p.s. It’s my day off and it’s sunny, so I’m spending the day outside! I’d like to think that they’ll never really know who Banksy is. He’s sort of like a superhero like that. Have a great day off in the sunshine! Melinda – I agree. I love the mystery of Banksy and you’re so right – superhero is the perfect word to describe him. That’s exactly the bridge, by the Value Village. Take a peek the next time you’re up there thrifting. i’m so with you karyn – you know what a colour and pattern whore i am, but there is something so serene and natural and contemplative about this. it’s almost quietly subversive to do an underpass mural in white and grey – it totally breaks the rules of what public art “should” look like. thanks for sharing it. Really nice. I love the quiet colour scheme. Jen – It’s definitely much more difficult to do subtle well and most people need to have something hit them in the face in order for it to make an impact. I’m so thankful when something like this piece gets to exist to make a quiet statement. Siobhan – Thanks so much for the link! That video is fantastic. 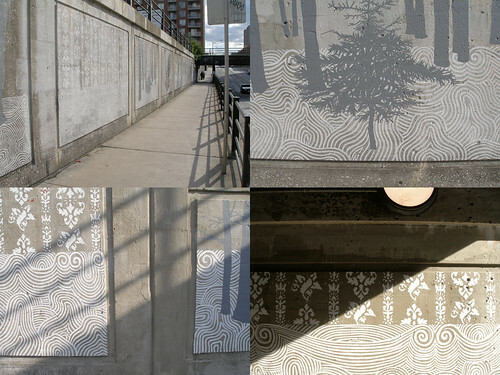 Reverse graffiti is so damn clever, I can hardly stand it.